A Garden Detail from the 2012 Tour. Hermann Welcome Center is at the corner of East First Street and Market Street (Market Street Plaza). Tickets will be sold here from 10 until 4 Saturday and Sunday. After you purchase your ticket and pick up your map, look at the large landscape design of Hermannplatz. Then walk out the front door of the Welcome Center and follow the sidewalk around the side of the building to the garden with the bronze statue of the German hero Hermann in its center.. The Hermann entrance garden was funded by the Garden Club and other community organizations. This beautiful garden has year-round color. Plantings include Boxwood, Hydrangea, columnar Norway Spruce, Holly, Weeping Redbud, Itea, Fothergilla, Sedum, Grasses, and various perennials. Visitors: Please do not rely on GPS to find gardens. GPS is unreliable in both the town and country tours. Please note that Country Gardens are only open on Saturday. Pass through the beautiful old iron gate and step back in time, greeted by gardeners in period attire. A traditional German four-square gemusegarten is planted with heirloom vegetable varieties, as it would have been in the 19th century. A small 1880s half-timber barn with historic tools and farm equipment will be open to explore. Dulcimer music on Saturday adds to this garden’s unique appeal. Be sure and sample pink lemonade and Springerle cookie. Free heirloom gardening handouts will also be available. Guided tours of the 1840s Pommer-Gentner House and Strehly House Winery/Print Shop are available at 10:00, 12:30 and 2:30, for an admission fee. The special exhibit, “What Wondrous Life: the World of George Husmann” will be open from 10 – 4 sharing the life and achievements of the Hermann youth who became the father of the American wine industry. Hermann was the wine center of Missouri prior to Prohibition and this special exhibit features never before exhibited images and artifacts of the period. Enter the passageway between the 1842 house and the ca. 1857 winery building. Pass through and down a flight of stairs and emerge in the backyard, where you may walk beneath a shady arbor covered with grapevines planted over one hundred years ago. Admire the terraced garden, with its wealth of strawberries, rhubarb and asparagus. Lovely perennial beds front the picket fence surrounding the lawn. Look uphill for a stunning view of St George Catholic Church, and admire the vista of neighboring gardens across the back alleyway. Along the side of this historic 1886 building, you will find a lovely shade garden. As you enter through small round gate in the cute white picket fence (redone to match the original), walk down the short path, noticing the hostas and other shade plants along the way. 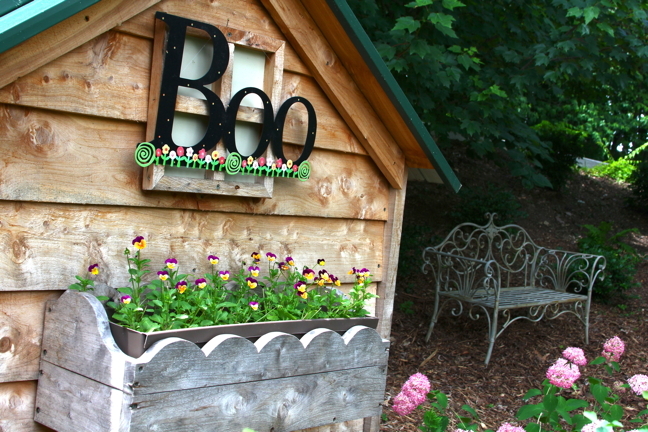 The garden is decorated with architectural elements such as an iron headboard, fire hydrant and other fun items. End at the bottom of the walkway without entering the back yard. The brick building was originally a stove and tinware shop. Note: Parking is.on the street in front and the garden is wheelchair accessible. To find the garden enter thru the front door of Back Home Again, turn into the rooms on the left, and proceed to the entrance to the back deck in the second room. Take the steps from the deck down into the garden. Florals are to the left of the stairs, vegetables to the right. Although there is no particular theme, this is nevertheless a peaceful garden with the space used for both beauty and function. There is a mixture of shade and sun plantings with some seating along its pathways to rest and enjoy the garden. Note: Parking on the street. Those with limited mobility will want to note that there are steps. Breathtaking views of the Missouri River, a water feature and winding paths bordering well-tended plantings are hallmarks of this magical garden. The owners oversaw the planting of more than 2,000 trees. Little wonder that the gazebo and indoor chapel are popular wedding sites. Walk to the outdoor ceremony site and then through the gate onto the outcropping of rock where the bridal couples say their vows. Also visit the nearby "Celebration Point" where pre-rehearsal gatherings occur. Savor the unique ambiance here; this is what has made Hermann a special destination for 170 years. Notes: Brochure in a holder in front of the Chapel. Parking available for all size vehicles. 8 Wildfire Blackgums, 5 Tulip Poplars, and 2 Sugarberries. They were supplied and planted by Pea Ridge Tree Farm. Principles of flood resistance and conservation governed the choice of trees. Between 10:00 a.m. and 4:00 p.m. there will be a member of the Hermann Tree Commission on hand to discuss the Lower City Park landscape plan, which includes a total of 83 new trees including several types of oaks, maples, honey locust, plane tree, and bald cypress. Trees may be purchased by sponsors, as memorials, special gifts, or commemorations, at a cost of $375, which includes a donor plaque. Looking down from this vine-clad slope, one can envision 19th century Hermann, with its patchwork of vineyards, and tidy backyard kitchen gardens, among the brick homes and businesses of its German settlers. Observe the imposing rock cliff and its tumbling waterfall. Beds of carefully tended blooms and the terraced Norton grapevines make this an especially harmonious hillside setting. Look for the hundreds of pink tubes noting newly planted Norton Grapes. Notes: Brochure in the holder by the Rose Garden at the top of the drive. Parking at the Inn is limited. As you drive up the hill to this beautiful estate home, notice the vertical wall bluffs, the ferns and wildflowers, and the glade with cactus, cedars, and native hardwoods. As you drive, look for places where you might pull over if you meet meet on-coming traffic. The home is surrounded by many landscaped berms beginning with the middle of the circular drive. Take a moment to enjoy the many breath-taking views of the rolling hills. Begin your tour by walking around the house to the left noticing the various perennial beds and the plantings around the patio and Romeo/Juliet balcony. Continue to walk around the house noting both beds near the house and on the periphery near the trees. And listen to the birds. Note: Park at the top of the hill in the gravel parking space to the right or on the close to the right-hand side. Road access is single lane. Vans and cars will be fine. It is not accessible to buses. The garden is partially accessible for the disabled but not fully. After parking on the road, enter this country estate garden at the concrete drive way. There is a purple theme throughout the garden in the many flower pots and ground plantings. As you begin to walk up the drive, enjoy the flower beds on both sides, and notice that the detached garage and house have matching window boxes. Walk around the front of the house to the left, noticing the flowers on front porch and beds displaying lots of flowers. Do not miss the beautiful view of the valley and hills. Continue around the house to the large back patio with lots of stone work and double waterfalls. The Coles Creek Bluff is an amazing background display. Watch for the many hummingbirds and butterflies that are attracted to the garden. Parking: Park along the county road and walk to the driveway as there is not adequate parking or turn-around room . The driveway is on an uphill incline and there are steps so it is somewhat limited to disabled visitors.